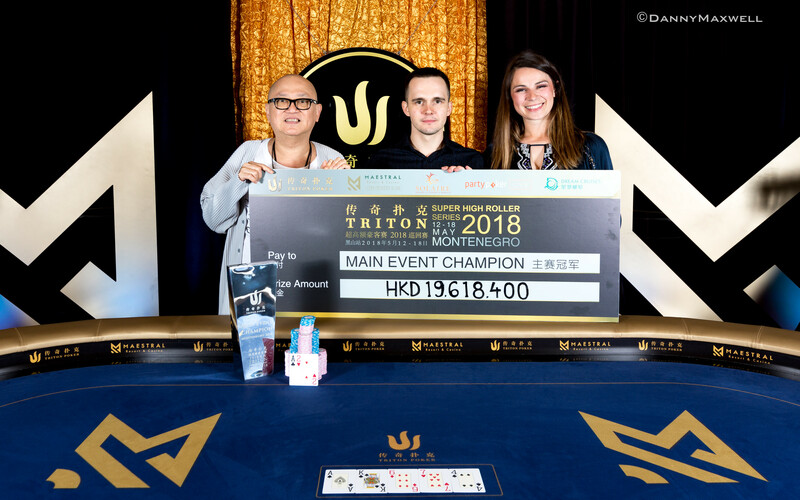 The highlight of the 2018 Triton Super High Roller Series Montenegro festival at the Maestral Resort & Casino has determined a champion in it's HKD1,000,000 ($132,000) Main Event. Ultimately it was Mikita Badziakouski who came out on top of the 63-entry strong field to claim the lion's share of the HKD59,270,400 (~$7,550,129) prize pool after defeating Frenchman Rui Cao in heads-up. Badziakouski started the day third in chips and soared to the top of the counts with five players remaining before holding onto the lead until a winner was crowned. The score of around $2.5 million vaults the Belorussian to more than $9 million in cashes on the live poker circuit and it is the fourth outright win and first major title away from the virtual realm. 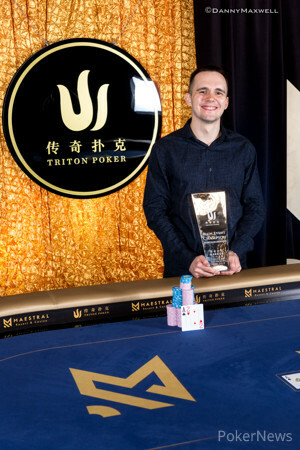 When asked whether or not his secret to the victory was taking part in the record-breaking high stakes cash game until six in the morning the previous night after reaching the final table, Badziakouski replied with “No, it's just the way it worked today, I got lucky,” in the winner interview after all was wrapped up. The online handle of the High Roller regular is “fish2013” and that has become somewhat of a running joke at the poker tables, even despite his victory that bumped Badziakouski's earnings on the live circuit to more than $9 million. "Actually, there will always be jokes about that,” he added with a smile and confirmed to soon jump into the final event of the festival, the HKD1,000,000 Short Deck Ante Only. Peter Jetten claimed the final spot on the podium while tart-of-the-day chip leader Steffen Sontheimer had to settle for 5th place. Steve O'Dwyer was ousted in 7th place and defending champion Manig Loeser exited in 8th place. “I would have loved to win again, it was a fun day still and happy to have made the final table anyways. I absolutely enjoyed myself, nice location." 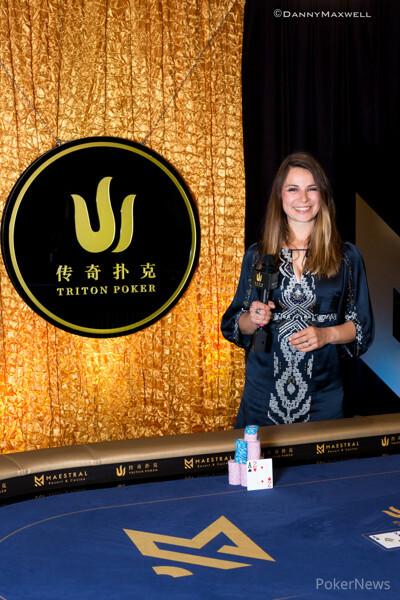 One year ago, Loeser defended Triton founder Richard Yong in heads-up to lift the trophy here in Montenegro, but it wasn't meant to be back-to-back victories for the High Roller regular. 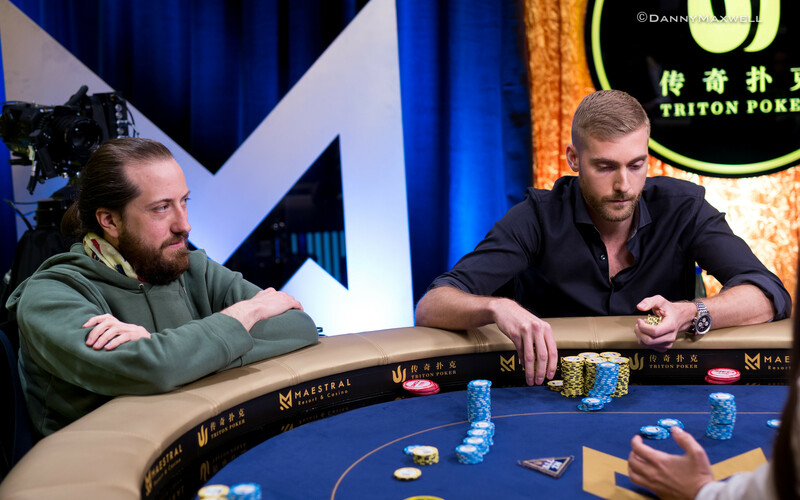 After a roller coaster bubble period the night before, Dietrich Fast returned with a mere nine big blinds and it was no surprise that the German bowed out first. Fast three-bet shoved with king-queen and, after a small reraise by Rui Cao with ace-queen, headed into the showdown against the isolation shove of Manig Loeser with pocket kings. An ace-high board changd nothing and Fast headed to the payout desk. Despite chipping up early. Manig Loeser was the next to run out of chips. First Steve O'Dwyer doubled through the defending champion when his nine-high flush draw got there to crack the top pair of Loeser. Soon after, the German lost a flip with ace-king suited failed to get there against the pocket sevens of Mikita Badziakouski. And the next big name of the international poker circuit would follow suit in Steve O'Dwyer. The American poker pro with Irish roots doubled once more before losing all but half a big blind with ace-six versus ace-queen. Rui Cao finished the job he had started in the very next hand. O'Dwyer was forced all in with pocket jacks and Cao's ace-flop got there on the flop. Ivan Leow's run came to an end in 6th place when his dominated ace-deuce was no good versus ace-ten and Steffen Sontheimer soon after followed him to the rail. Having lost the top spot to Mikita Badziakouski, the German four-bet shoved with ace-queen suited and three-bettor Badziakouski called with pocket jacks and held up to cement his top spot further. Badziakouski was also responsible for the next casualty after winning a flip with ace-king suited versus pocket sixes, Wai Leong Chan was already drawing dead on the turn and a meaningless six on the river was somewhat of a needle. That left the remaining trip with Badziakouski in a commanding lead, while the two short stacks Peter Jetten and Rui Cao were fighting for the pay jump. Eventually, it was Jetten that had to settle for third place. “It was just such a slow burn at the end, I didn't win a hand it felt like, three-handed, maybe that one pot against Mikita. Other than that, just didn't seem that I ever had the best hand and lost it until I had to call off with the worse hand. The worse hand in that case was queen-seven suited in a battle of the blinds against the push of Cao, who turned over king-six suited. Cao flopped top pair and the hearts flush draw, and Jetten's runner-runner miracle never happened. 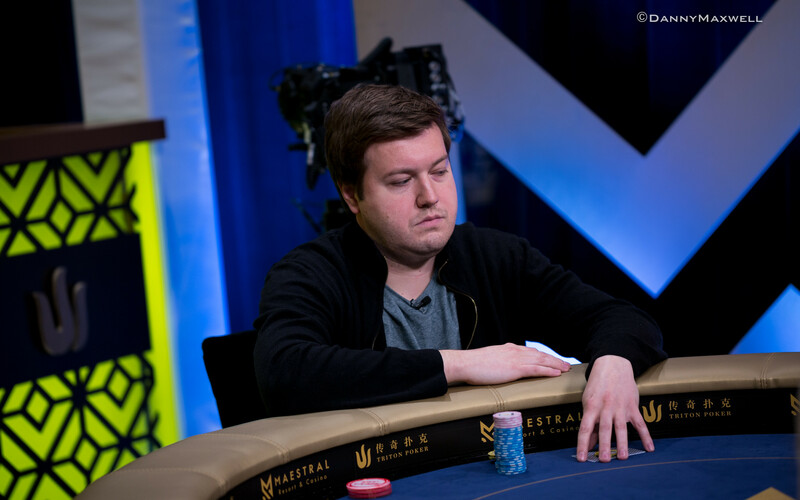 Badziakouski had a 2-1 lead heading into the heads-up and never surrendered the top spot despite Cao pulling close. The old chip order was established soon after and Cao went out with flying flags after his queen-high bluff was called by Badziakouski with ace-deuce for top pair. While the Main Event has wrapped up, the HKD1,000,000 ($132,000) Short Deck Ante-Only Event is in full swing with frantic action and Cao, as well as Badziakouski, are both expected to join the mix. Rui Cao raised to 375,000 with the and Mikita Badziakouski called with the . Both players checked the flop to see the on the turn, which saw Badziakouski bet for 250,000 only. Cao raised to 750,000 and Badziakouski called. On the river, Badziakouski checked and Cao had 3,050,000 behind to move all in. With two time bank extensions remaining, Badziakouski used one of them and carefully studied the board before making the call and sending Cao to the rail in 2nd place. Cao went out with flying flags and a bluff, and he takes home HKD13,217,000 ($1,683,648) for his efforts. The Frenchman will likely jump into the Short Deck Ante-Only event soon and the same applies for Badziakouski. In a limped pot to the flop, Mikita Badziakouski check-raised from 150,000 to 500,000 with just and was called by Rui Cao with the for a flush draw. On the turn, Badziakouski bet and forced a fold. Mikita Badziakouski raised it up with the and Rui Cao defended the . Both players flopped a pair on and Cao check-called a bet worth 250,000. On the turn, Cao checked and Badziakouski let his shot clock run down before announcing a bet of 750,000, which forced a snap-call from Cao. Badziakouski raised to 350,000 with the and a three-bet to 900,000 by Cao followed, who had the . It was the first tree-bet of the heads up thus far and Badziakouski quickly folded. Mikita Badziakouski raised to 375,000 with the and was called by Rui Cao with the . Cao checked the flop and folded to a continuation bet. Cao limped the button with the and Badziakouski checked . The flop was checked by Badziakouski and he check-raised from 150,000 to 500,000. Cao called and the duo headed to the turn. Badziakouski now made it 1,100,000 and Cao tossed in the call. After the river, Badziakouski made it 3 million to go and Cao folded after having missed out on the open-ended straight draw. In a limped pot to the river, Rui Cao checked with the and Mikita Badziakouski bet 275,000 with the . Cao gave it some thought and called, then mucked. Badziakouski raised to 375,000 with the and Cao came along with the . The flop fell and Cao checked before calling a bet of 250,000. No betting action took place on the turn and Cao bet the river for 250,000, Badziakouski folded. "No bluff raise?" Cao said with a grin but received no answer. Rui Cao raised to 375,000 with the and Mikita Badziakouski called with the . The boar fell and both players checked. On the turn, Badziakouski bet 200,000 and Cao called. The river was checked and Cao claimed the pot. Badziakouski limped the and Cao checked . The flop was checked, and the same applied to the turn and river. Cao raised to 375,000 with and Badziakouski called with the . Neither player bet the flop and Badziakouski checked the turn before calling a bet of 450,000 with third pair. On the river, Badziakouski checked once more and faced a bet of 1 million by Cao. Badziakouski called to get shown the bad news, while Cao closed the gap to all but one million in chips. 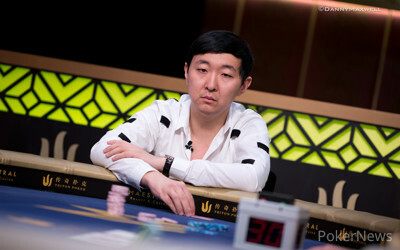 On the river of a board , Rui Cao checked to Mikita Badziakouski with the and Badziakouski bet 250,000. Cao check-raised to 1,200,000 with his king-high and Badziakouski called. Cao tapped the table and said "nice call" while dropping down to around 4 million, Badziakouski jumped to 11.3 million to further build his lead. Cao raised to 375,000 with the and Badziakouski called with the . On the flop, Cao continued for 250,000 when checked to him and Badziakouski came along. The on the turn brought a check by Badziakouski with his open-ended straight draw, Cao bet 575,000, Badziakouski called. The river improved Cao to a full house, Badziakouski checked and Cao moved all in. Badziakouski asked for a count on the shove, which was for 2,815,000, and gave his opponent a stare down before folding. Who Will Win the 2018 Triton Super High Roller Series Montenegro Main Event? Torbergsen Busts with a "Short Deck Move"